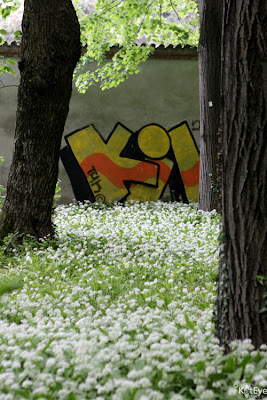 As I was photographing the flowers under the trees last weekend, I started to notice the graffiti on the park wall. My goal became to adequately capture the contrast in the scene, between the natural beauty and the man-made creativity. This is very nicely executed, artistic graffiti, but it doesn’t belong in this setting. That makes it all the more interesting to me. I also couldn’t help notice the irony of the signature and the copyright symbol. Here we have an artist seeking legal protection for an illegal act. Another contrast, layered within, that made me think. Do you think artistic protection of an illegal form of art would hold up in a court of law? An interesting conversation, for sure. I found this after the “waiting to click” shot I envisioned, of a bicyclist riding the path through the flowers, just didn’t work out. There were no bicyclists coming by at the time I was in the park. Actually, there were a couple of men who rode by on mountain bikes, but I was looking for a dressed-up Italian woman on a city bike. Never happened. I gave up on waiting to click and went seeking something else to shoot, when I found this image. Has your “waiting to click” shot worked out? It’s not too late to link in to Exploring with a Camera: Waiting to Click. Today is the last day to link in, and tomorrow I’ll share some new images from the Flickr pool. It's quite a contrast isn't it? I expect every graffiti artist thinks he/she's a potential Banksy so they copyright just in case!! These kind of images always draw attention, something not in it's own particular landscape, it's called a 'hook'. Looking to shoot with something in mind is like shopping for that particular outfit, you never see the right thing at the right time! Cool shot! Here in Germany there are several locations where it's perfectly legal to create graffiti. There's a whole hierarchy to who may over-paint who's work and everything. I imagine their work is protected by copyright just like any other artist. This makes me wonder if this photo of yours became famous, could you ethically reproduce it for sale since it includes somebody else's work? We have been clearing our gallery of all artworks that have been copied partly or entirely from another artists work and also any portraits for which we have not had permission, in the light of the recent prosecution case. Initially we added notes to our pieces to state the original work and artist that we had taken our inspiration from until we realised we were in fact admitting to copyright fraud! Am drawn to graffiti. Have a series of railroad cars and always looking for more. It is an art that goes against everything, right…yet apparently is everywhere. Never thought of it as being across the world and within the flowers. Cool Miss K!